Three good miles this afternoon, and no problems. I stretched carefully before, during, and after, and my hip (the first one, hurt in the river) is still tight. I know it's there, I'm treating it well, and it's running happily. According to Map My Run, it was just under 3 miles, and since I haven't been running, that's pretty impressive to me. While this longish (don't laugh, Suzee) time is great for my head, I also want to do some interval work. The one block I ran like I was being filmed -- cue Chariots of Fire theme song -- felt so good I wanted to do more. But I didn't, and I'll be able to walk happily to the end hour of the farmer's market tomorrow as a reward. And since the middle Things went to bed quietly, I bet we find our way to the KettleCorn vendor too. Heh heh. I know the pun is allegedly the lowest form of humor, but I can't help it. I like them and many other obvious funny things. So, on Friday, we scooped up all of our children, plus a friend for Thing 1, plus my sister and her kids, and we all went to the county fair. It's another summer ritual that my children are beginning to insist on. And every year, I have the same range of reactions. First, it's incredibly hot. This year wasn't as hot as last year, but we had the added fun of air you could practically cut with a knife. I felt guilty for driving, guilty for breathing it even. One of the things I most enjoy -- albeit not guilt-free (is anything, for someone with a brain?) -- is roller coasters. Preferably in the company of my sister, but I'll ride with anyone. That said, the ones at the fair always give me the collywobbles. I wonder if they're put together well. I wonder how far they've traveled and whether the folks tightening the bolts were on illegal substances. So at the fair, I want to love the coasters, I want to share them with my kids, and I'm worried. Of course, my children love the rides. As far as they're concerned, the county fair is an amusement park with rides, cotton candy, and a few animals their mother forces them to look at. So I rode. I rode with anyone who needed an adult; I rode with people who just wanted company. I rode and rode and rode and rode, but not the rides I like, because the kids who are big enough to ride those were off riding them -- I rode anything the kids wanted to ride. Thing 2 said at one point, when I was shrieking with laughter while spinning backwards, "I didn't know mamas liked this kind of stuff," and I thought, "Oh honey. . . you have no idea." There wasn't much shrieking, however, because mostly it was swinging. Over and over and over and over. I think Thing 4 and I went on the little swings about 73 times. I kept saying "Yes," because that was my mode for the day, but I discovered that I get tired of little swings. I even get tired of big swings. Especially when the midway features really loud, loud loud bad covers of '80s music. My ears, like my eyes, are quite tender. Thing 4 revealed that she's much like her mother in her love of rides. I was pleased to note, when I saw this picture, that her cropped hair still looks okay to me. The operator of this ride was terrifically understanding. She allowed this little one to ride without getting off between rides. So she rode. And rode. And rode. She rode with cousins, she rode with siblings, she rode by herself. She just loved it. And we got to stand in the background and not ride, for which I, at least, was devoutly grateful. That operator actually took a lollipop out of Thing 3's mouth so he could ride -- endearing her to me forever. He's not so jaded yet, so that even though he's just tall enough to ride the adult-sized swings -- will I ever get over the stomach-sinking feeling of watching them fly through the air? -- he's still able to enjoy a carousel. So I have ideas for next year, based on this year's experiences. We need to stay home until after naptime, if anyone is napping. We need to bring the big stroller with a cooler and lots of half-frozen iced tea and lots of food. We need to save up our money, so it doesn't seem like such a shock to pay for everything. We should buy discounted tickets ahead of time. Maybe, just maybe, Eric and I should go alone for one day, so we can do the looking at tatting and petting baby cows stuff that missing makes me so cranky. We should definitely go when a bad band is playing so I can see them. I think I missed The Village People (!) this year. Rats. I want the kids to appreciate the things that mean "Fair" to me, too, and they tried -- really they did. They were excited that their friend's duct tape shorts had won first prize and that my friend had won best in show for her yummy-looking pie, but . . . the loudness of what was marketed as "fair" overwhelmed any more contemplative pleasures. And that, finally, may have been what really wiped me out. My love for coasters doesn't overwhelm the setting in my brain that says "Fair=harvest festival" so when reality feels like Fair=loud, loud, loud "entertainment," and I see so many beautiful, really beautiful young women in all their glory, wearing more makeup than they need, in teeny skirts (funniest comment of the day was when spouseman nodded toward a lovely young blond thing in a scrap of camoflauge skirt, and said, "That makes me feel really patriotic"), and I realize that they're incredibly anxious, because, look at them, they're beautiful, and my kids are wildly overstimulated and I just want to wander around and look at the knitting and the quilts and eat homemade cake and maybe ride a few big coasters. . . well, it's a lot of expensive cognitive dissonance. I'd rather go to an all-animal and knitting and pie fair and save the big bucks for a coaster park. But I will keep going back to this one -- maybe we'll enter things again and that will help -- because the kids enjoy it pretty thoroughly. See? That sound is coming, intermittently, from my kitchen. My sister came over today and in a few hours we produced strawberry, ollalieberry, and plum jams. Each one was, in its own way, an experiment, and we tried making the strawberry with honey, not sugar. It tastes better over yogurt than I expect it will on toast. It's a good thing she and I move well together, since at one point she was stirring lentil soup with her left hand, plum puree with her right, and I was filling and wiping jars from another pot of puree. We tried to get pictures, really we did, but the back up camera is on the blink also. My real and much-liked camera should come home this week. At church today, I noticed that the yellow plum tree is dropping gallons of plums. We may have to bike over there tomorrow and give it a little shake -- the woman who usually makes jam for church sales said the fruit was too high for her. I thought of my little climbers . . . not too high for them! We didn't quite make the math work, but both of us figured that even with sugar and pectin and jars, free, probably-not-sprayed fruit was cheaper in the long run than buying it. And we do love to make jam. Throwbacks, both of us. Whoopie! When I die, I half-seriously want chiseled on any commemorative stone: "How hard can it be?" because that is so my approach to life. I've posted about this before even though I can't find it now. In so many of my activities, like beekeeping, schooling, gardening, childbirth, house repair, I follow that leading, with varying levels of success. I don't think that "experts" have all the answers; I do believe that people can do more, far more, than they think they can, and most things reward just leaping in and trying. There are one or two areas, though, that I've discovered this attitude isn't a big help. Household electricity, for one. There are probably one or two others, but the one I'm thinking about right now is even closer to home. I discovered a few years ago that paying through the nose for a really good haircut made a huge difference in my hair, which I've loved for years even with a bad cut. A good one? I'm a hair-goddess. And my spouse wore his hair the same way he had since he was 12 until I talked him into going to Expensive Hair Salon with me, and now he looks. . . updated, and very nice. All that to say I should have paid closer attention the other day when my nephew and youngest daughter were being very very quiet. Both hips took me out for a short run this morning. And they didn't twinge a bit. Careful attention to biomechanics -- no crossed legs, no sleeping twisted -- and some (quite painful, actually) chiropractic adjustment seems to have done good. A slow two miles and nary a pause today. I'm so grateful for this body, so grateful to be able to run and get to that nice, brainless, footfall after footfall state. It's worth a bit of care. I've been struggling with this post for about a day now. There is so much more I want to say than, "Look, we picked berries." And I've been wondering why. Finally, I figured it was because I was trying to talk about other things and using berries as a lens or metaphor or something. And it wasn't some weird attempt to be profound, it was trying to put words to what my experience around this yearly trip is. I'm still not sure I have it right. Our outing to the berry patch yesterday felt kind of like a pilgrimage. I was thinking about why we do this. It's a long drive, only me and two of my kids really love berries (spouse and first child loathe them), and we can only go about once per year. But the summer doesn't feel right to me without this trip, and it dawned on me that this is how you build a family's memories -- layering experiences over and over again, so that each repetition of the activity is informed and colored by the previous ones. Like fine layers of glaze building up to make luminous colors, rather than one thick blob of paint which doesn't let light through. All of that aside, it was like the Keystone Kops getting there. While we waited for my sister to get her hair cut, the Things and cousins picked about 10 pounds of tiny plums in her back yard. A friend who was going with us was dropped off; another friend called and said she'd come and meet us. I figured that cooking down and straining the plums was probably a good use of our time. Finally, she had about a gallon of "plum gunk." We'll make jam on our schedule that way; the rest of the week and weekend didn't look promising. Then our friend showed up and we began the "who sits where" negotiations. I ended up with all of the (rather loud) middle aged children, while my eldest and youngest rode with my sister. I could see my big child talking, laughing and gesturing cheerily at her aunt. "At least they're having fun," I thought. Needless to say, I rarely get the incandescent side of that child these days. On the way there, we made a total of four stops. One bathroom indoors, one bathroom outdoors. The indoors one was accompanied by coffee-purchasing. One re-buckling of a carseat, one gas. I thought, "This is what happens when you get more than two homeschoolers together. . ." and decided, quite consciously, to let go of any expectations about when we'd get there or what it would be like. This trip is just something I love, and it didn't matter how I executed it. Finally, and it's taken me years to learn to read the road cues, we got to the farm. Loading up into their car were beloved friends, and while I would have loved time to catch up, they were done. Of course, we couldn't go right out and pick because the kids were predictably hungry. Just like that, while the day was unique, the rhythm felt exactly the same as every other year. I remembered the year I made myself sick eating berries, hanging a very pregnant belly over my knees sitting on a little red wagon. I remembered the year the berries were all over 1.5" long, and the year that they didn't taste very sweet. So it was like looking at a beloved face and seeing it at different ages -- or looking at pictures of someone younger and seeing their adult face in them. Layers upon layers, all in some irrigated berry vines. The children are getting better at picking, or at least better at picking when they want to pick. We had to remind some of the male ones not to throw berries, and Thing 2 seemed to get distracted by the cosmetic options offered by them. I tried to make Thing 1 laugh and she dismissed my efforts. We kept crying out, "Make every berry count!" and coached the kids to look for "Dark, soft, big berries!" I only wish we'd gotten one flat more. Somewhere I lost count, or we would have had one more. Tonight there will be hand pies for dessert and bagging of the frozen berries, and then the frozen ones will quietly slip into the new freezer, so that we can warm ourselves with the taste of summer no matter what time of year it is. Really, almost nothing makes me happy like this. I was so mellowed out by the entire berry experience that when my kids asked to stop at the beach, and we were the only ones stopping, I said -- Yes! They know my Rogue Wave paranoia, but I managed to breathe and stay close to the little one and not try to notice the weird color of the sky because of the fires and how ominous that made this little gray beach seem. Instead, I watched my children shed their shoes and run at the edge of the water like gangly birds and I was so glad to be there. I did try to distract them into a lovely little carved-out cave in the rocks away from the water, for a little bit, but when that faded, I threw seaweed as joyfully as I could and didn't think about my precious babies tumbling in the water like it. I just was there. Until I couldn't take it any more, so one more cliff walk and we headed back home. It was a very good trip. Don't throw me into that briar patch! Off to my very favorite berrying place in the whole wide world so far. We'll be up the highway a bit from the windy strawberry beds, so hopefully tight ponytails won't be necessary. Today's quest is Ollalieberries -- and I have a new freezer that works in which to put them. Hooray! I don't know who all will show up as we just put out a general call for berries, but it's always a good time, and as the children get older, fewer red berries show up in our picking flats. Thing 1 is like a professional picker, so there's always plenty of good stuff. I even checked the weather -- it's going to be very cool. We'll have hoods and hot drinks, and hopefully it won't be too cold afterwards to stop in at one of the beaches which give me a heart attack practically on contemplation. I've decided to stop being afraid and just deal with things. My hips are worlds better, although I'm still careful about what I'm doing. Good biomechanics and all that. I want to run badly enough not to run, if that makes sense. But before running, picking! Things certainly don't work out the way I expect sometimes. I think I'm going along fine, and bam. Things slip and slide in unexpected ways. Not surprising, since I live on an unstable edge in the most literal sense. Chiropractic today undid that sore hip. "Your pelvis is all torqued up," she said. Then, as I tried to get up, the right side seized up in response. Apparently it had been compensating ever since I played in that river. Tomorrow is a freebie revisit. Maybe it will let go soon. And I can't run or do situps for a while, too. Good thing I have a million papers to grade, I guess. ". . . Anyone who says differently is selling something." True or not, my hip is pain. Even my cure-all of a 4 am bath didn't fix it. It might be one of the myriad of things that only time will heal. And I don't feel like taking it out running, even though the straight motion doesn't hurt. Since everything else does, I'm going to try to take it easy. But what to do about the missing rush from running? Sublimate! I'll scrub the kitchen floor or something today. Well, after the yogus interruptus this morning, we decided to get everyone out into the woods, as the unpleasant heat has lessened. So our church was wandering straight uphill in one of the regional parks. We missed the redwood area, but ended up in an oak wood. My kids haven't yet figured out that complaining about things doesn't make the unpleasant go away, but I kept telling them they'd appreciate it later. The withheld bag of coffeeshop treats was the carrot all the way uphill. While my cries of "Look! Natural beauty!" and "We're so high up!" weren't much help in turning the grouchies around, finding a spreading, huge live oak tree to scramble up and around was the real turning point. There's something about climbing that just does it for my brood. On the drive both ways, my spouse volunteered to drive so I could get the heel done on my last sock. It's only four rounds before the gussets are done, and I know how fast the rest goes. They weren't perfect on the way down, but they were better, and we saw one of these, and I even correctly identified it! Whoopie for nature guides. Plus, the name "California Sister" just cracks me up. I have one of those. . .
Now I get the fun of marshaling the forces for a quick houseclean and laundry sort, and I'm going to reward the helpful with ice cream, leaving the uncooperative at home to ponder the wisdom of being on the spot the next time it's a choice between doing what you're asked and doing what you want at the moment. The joy of duty, indeed. "The only joy is the joy of duty"
As I started my yoga routine -- I'm trying to do that on my days I'm not running -- I wondered why it had even occurred to me. First I remembered the ugly meltdown that Thing 3 had last night, after a few others during the day. I'll have to deal with that again today, even if it's just the consequences for that behavior. Then Thing 4 got up and demanded that I stop my morning routine and I remembered. It's hard to fit in activities that aren't pushed by necessity right now. Either it's the kids, or the job, or the house, or the millions of quotidian details that support those things. And what that looks like on the ground is a fallow garden, but paid off credit cards. No knitting for days, and my spinning wheel is wondering who I am. I know some people can fetch wood and carry water during even the most harried lives, but I'm finding it hard to make my joy. Oddly enough, something that looks like "duty" seems to be one way in. Running frees me up inside in good ways, and leads me to gratitude for the body that can run. And just knowing that joy -- and duty -- are both important to me can be a good guide. I can't meditate, and this post by Crazy Aunt Purl pretty much sums up my problems with it. But I can run, and I can make choices, and I can look for joy in any interstice of duty I can find. And maybe, if I keep doing that, the joy will be in everything. When I get up at 5 am and decide to do a little bit of yoga, it is not a coded message asking you to wind yourself around my legs, flop on your side, and beg for attention. Really. Zipper is back again. I'm so glad I didn't throw away those chilly mice in the freezer! I opened a cabinet which is built against the defunct brick chimney that runs from basement to attic in our house, to grab some oil tonight, and who was staring back at me but him. By the time Thing 2 was found, he was halfway into the wall again. She grabbed hold of him, and after the nice man at the pet store suggested we chill him down with wet towels to relax him, she managed to pull him out. He's back in his cage. And he's bigger. I don't even want to think about what he's been eating for a couple of months. Sigh. Just a delightful spot, is Caswell State Park. Plunked right down in the majestic (okay, probably more majestic a number of years ago, now prodigiously overdeveloped and agriculturally productive) Central Valley, it's a reserve around the Stanislaus river, and a rare mature riparian oak ecosystem. We actually didn't explore much of it, because our circuit ran from our campsite to the bathroom to our campsite to the river, repeat over and over. But there were more memorable moments than you'd expect from a two-night stay. My sister, shaking her head and whining, "Why are there bugs flying up my nose?" Repeating over and over, "Don't swing the flame on that stick near your hair. Or your cousin's hair." "Marshmallows are for after dinner." Thing 4 cavorting nakedly like a chubby water sprite in the first rays of the sun along the edge of the water. She didn't seem cold, she was just delighted to prance and splash. Having to first enter the rather chilly river water at full speed to catch Thing 3 as he drifted past on his floatie much faster than he'd anticipated -- put any of my "can I save my kids" fears right to rest, as I found that even while tugging a frightened child and a floatation device across a fast current, my sidestroke was up to the challenge. Thing 2 crying out, "A dead fish!!!" and throwing herself in the river, swimming as fast as she could and then emerging triumphant with a dead catfish in her hands. "Can we eat it?" was her first question. After I said that no, we weren't going to eat it, it became a plaything for a few hours. We kept pointing out that dead fish smelled and smelled quickly, especially when left in the sun -- and I kept wondering if it was going to end up in my knitting bag -- but she was a celebrity among the other families on the river for a while. My sister rolled over and said, "If I'm ever on "Survivor," I want her on my team." Having our friend identify trees, plants, and wildlife for us. She's a treat to have along, and not just because she brought pre-cooked spaghetti for a fast, fast camp dinner. Hearing a bullfrog croaking from right across our swimming point. Actually having a few real conversations with my sister. It's a treat I don't get enough of. I can't imagine not having her to talk to. Musing on what the life of a camp host must be like. Thing 4 spending all night kicking her snoring sister in the face while grinding her head against me. Nothing like rotating 90 degrees in your sleep. The same pathetic bullfrog tadpole being caught, named, and released every day. Coyotes singing us to sleep from the ridge away from the river, being answered by a forlorn-sounding dog on the other side. Seeing the full moon rising over the river. The children's wonder and delight at seeing their moon shadows, and Thing 1 didn't roll her eyes (or maybe it was too dark to see) when I warbled Cat Steven's "Moonshadow" all the way back. My sister and I set out for a long float down the river, and were joined by Thing 1. I was exhausted, since I had stayed up in the middle of the night before, and so I planned to float on my $2.99 raft simply holding on to my sister's toes. They'd take care of me, I figured. And they did, until even with a warning from Thing 1, "Look, do you want to go on the bank side of that submerged tree or the stump side," my sister dragged me right over a slightly submerged branch. As I was saying, "No, no, I'm fine, really," the two of them looked back and burst into laughter. "There's a piece of your raft stuck on that tree!" Gales of hilarity. Meanwhile, I was slowly, ever so slowly, sinking into the water. Some air stayed in the outer channels of the raft, and the pillow was still inflated. So we put out at the next likely-looking spot. "Um, there's no trail here." "Ow! OW! What's stinging me?!!" "It looks like stinging nettle. Got any plantains?" "Oh, hey, is that a wasp?" "Look up there! It looks just like the nest in Look Out for Pirates!" "Ugh! Mud! Plants! Submerged tree!" "I don't want you on my team on 'Survivor.'" I figured they owed me, so I lay my pillow next to my sister on her tube and threw myself across her lap. We limped down the river, limp from laughing, and found an actual landing spot which led back to the camp. Thing 1 kept muttering darkly that it was just like the camping trips where we forgot water or underwear or something, while her aunt and I kept pointing out how much fun we were -- "No one has cooler parents or aunts than you." -- and how benign the adventure really was. Getting up at 5am makes for long days. I almost crashed on the couch at 6pm, but had to wrestle the three youngest down for the night. A long bedtime routine has the quixotic effect of waking me up. *yawn* I need to drive tomorrow, for a camping trip, so it maybe a morning where I order a half-caf at some overpriced java joint. On the walk to church this morning, I was chiding my children for bickering and made some comment about singing about loving each other. One of the nameless brood said, "If God wants us to love everybody, then why aren't people easier to love?" I have got to pull the blackout shades down in my room. Because, like so much out there in the world, I'm utterly photophilic. Even through the early-morning summer fog here (one of my delights about where I live), the sun calls me. "Up, up! Do! Be! Play!" Notice how "Grade, grade!" isn't in the vocabulary? Maybe it's my Sicilian peasant ancestry coming in. I feel as though I have enough energy to plow a field and stomp some grapes. Then end it all with a huge family dinner and some really good cheese. Instead, I think I'll do some laundry and get the scones out of the oven. I hope summer is all it can be for you. In the few early moments before a horde of moppets demands -- in the nicest way possible, don't get me wrong -- their Saturday pancakes, I have a moment to post. Friends used to tell me that they didn't feel right if they didn't exercise. I laughed. Imagining a life where I wanted to do more sweaty work? Just didn't click with my experience. "Nothing affects my energy level normally," I said. "No ups and downs." Well, friends, the laugh's on me. I'm antsy, achy, and twitchy to run. Apparently it's been smoothing out some rough edges for me, and I wasn't aware of it. Even knitting doesn't help unless I've already done the sweaty stuff. An hour plus walk this morning might have helped take the edge off. Doesn't help that it's sort of crunch time for me in my classes -- many, many papers to grade. And that's not active work. I guess I'll have to do even more sit ups and pushups. Edited to add: Whoops! It's knit in public day -- guess I will have to go a few rounds with the sock. I wonder if my front porch is public enough? And I don't think I will be before that second sock is done. Leg doesn't hurt when I don't move, but there's a sort of dull ache and today when I tried to jog helpfully across the store from the checkout line to pick up the pita bread I'd forgotten (which the Dog I Used To Love ate before dinner while I was out), I remembered what I'd done. Rather forcefully. So I'm not going to push it. I'm loving the running so much that if I hurry my return to it I will miss it even more when I really can't run. I turned the sock heel today at the lake -- another swim day tomorrow, so who knows what might happen? I don't, as a rule, knit socks. I find them tedious to knit, although I adore wearing hand-knit socks. On this pair of Embossed Leaves socks, though, I'm doing okay with the dreaded SSS. 1. Choose a pattern that intrigues you. Some folks are all about the yarn -- squishy bouncy sock yarn, or self-patterning so that "just one more row" seems to pull them along. I'm not so much that way, although I'm open to the idea that I haven't met the right yarn yet. On the other hand, the 16-row repeat on this pattern is interesting enough and challenging enough for my lace-addled brain to keep me thinking, "One more leaf, one more leaf." 2. Choose a yarn you adore. Welcome, inconsistency! I know I said it wasn't the yarn, but I can't imagine knitting a sock in a yarn that wasn't great. The Knitpicks Gloss I'm using has enough color variation to make me hold it in the light, moving it gently back and forth to watch the play of light on the silk and wool. I've even made friends give their opinion: "See how there's subtle shading in how the different fibers dyed up? See how it shines?" They nod and back away slowly. 3. Make time. Seems like an obvious point, yes? Well, in my life, stating the obvious is something that makes a lot of sense. I've decided to devote my morning run time to the second sock, because, well, because this morning I was preparing to run intervals. I'm convinced that they are a great idea in kicking my running up to another level (despite still not being very interested in racing). So I jogged to the park, stretched, made my way to the baseball diamond where the plan was to run to first base and jog/walk the others five or so times. I lined up on home plate and started and wham! a muscle in my quads did something ominous. After realizing that it wasn't going away, I limped home to ice and ibuprofin. No running for these legs for a few days, at least. But hey, when they do run again? They'll have a pair of nice socks to wear afterwards. On my run plod this morning, I was out thinking how nice it was to be able to cross streets willy-nilly. This isn't an early-rising kind of town. As a matter of fact, I didn't use to be an early-rising kind of gal, either. Thank you, children. At any rate, I turned into my favorite shoreline loop and it hit me -- the water in the bay as still as though it were a glacial lake, and a single least tern, as graceful as a ballerina and as fierce as a hockey player, wheeling over the water. At the top of a loop, wings folded, it plummeted into the water and disappeared. Two strides later, up it flew to repeat the performance. And suddenly, I realized, this happens whether I'm here or not. In fact, most of life happens whether I'm there or not. So, how do I get to really be there in the bits I get to witness? How to appreciate my legs and feet, carrying me through an early summer morning? How to drink in the tousled heads of my kids, wandering in for a morning hug? How to appreciate the parts of my house that never do seem to get cleaned? How to appreciate the endless worried emails from my students? I have to figure out how to be here. Now, and now, and now forevermore. Or at least as forevermore as I get. While I was out slicing pineapple, and all other family members were elsewhere, one child to another: "Brother, brother!" "Please don't be crazy about Pokemon." "But I am. There's nothing you can do about it." "But girls don't like Pokemon." "Yes she does. She likes Pikachu, and Squirtle, Bulbasaur and Miu." Maybe it's the fact that I graded like a whirlwind today -- 32 papers and counting -- that made that so funny. But maybe I can earn a quiet evening finishing a sock toe. A gal can dream, at least. I found a camera today. Too late for the camping trip, but at least I'm not completely camera-free. So, the camping trip. New site -- it's hard to find a place to put this many homeschoolers. Some of the kids complained because there weren't any trails; there was just the beach. For me, it felt a little like my childhood, where there was, well, beach. Except that our beaches felt tame compared to this more northerly stretch, even though the ranger said the cove of the park was one of the very safest beaches. I still took no knitting, no reading, down with me. I had enough to do keeping eyes on my three youngest. 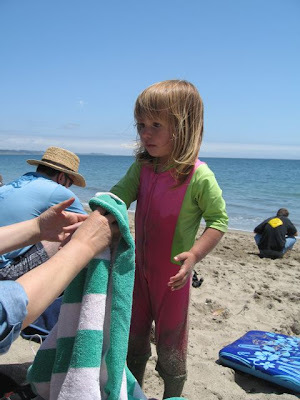 The eldest has a healthy respect for strong waves, and since there didn't seem to be an undertow (undertoad? Heee -- I'm so literary), I figured she was okay. The others would have been better outfitted, in my estimation, with climbing harnesses attached to those retractable dog leashes. Me, overprotective? Heh. Ask me about running with lollipops. Thing 2 borrowed a boogie board and went to town. That girl has white-water rafting guide in her future, I think. Something dangerous and fun, for which showers are optional. We shared out meal prep and that cut everyone's perceived load down, although meals consistently ran late. That was fun in the morning, when handing the kids marshmallows seemed like a fine choice. The perfect van performed, well, perfectly. If I'm not backpacking, I'd rather sleep in this womblike car than a tent any day. And, as I pulled out the seats to make the bed on the first day, the answer to "why should I vacuum before we go get dirty?" became abundantly clear. I'm going back to the ironclad "no eating in the car" rule. They can just wait. If I can't talk on the cell phone, they can go hungry. We're not making any great migrations. At night, I could hear Things 2&3 murmuring to one another. Random snatches of conversation: "Do you remember when we went swimming with Grandma and I went all the way across the pool on the noodle?" "Was it cold, or warm?" "Why don't we put it between us?" It was like eavesdropping on their future lives, without me. A nice thought, especially since they weren't hitting each other. The no-hike trip ended up feeling like the "moms who sat around and really needed to go for a walk" trip, but it was sweet. Lots of long, casual conversations. A little knitting, although kneeling on a bamboo DPN on a soft car bed when it's your last because you've lost the fourth tends to slow down the finishing of any, say, sock in progress. Tomorrow, maybe. Today, I've been a cleaning machine -- refrigerator, freezer, vacuumed all rooms, scrubbed the bathroom sink and toilet, and even took the stove completely apart and de-gunked it. Don't know where that energy came from. My brain is probably too fried from other stuff to do much mentally gathered activity. I've done, though, 1/3 of my grading. I'll leave the amount of mental focus that requires out of the equation for now. Camping trip over and done (post with pictures to come as soon as my friends finish taking pity on me and send me some of theirs); car emptied and cleaned; laundry in and awaiting hanging. So, of course, since I have three days' worth of teaching work waiting for me, I spent the hours from 2:30-4:30 am wide, wide awake. Yay! I resorted to my tried and true method for wooing sleep -- I ran a bath, dropped in some lavender essential oil, and grabbed a book. I would have headed for the computer to work if I could have found any pants -- it's cold in the basement! 15 minutes into my bath, here comes Thing 4 in all of her fit-throwing glory. "Would you like to join me?" "I can't, I can't!" (Guess what the new phrase du jour is here?) At least she didn't throw herself on the floor. Then of course she got in, hung out, then we went to my bed, where she lay in my place, and when I asked her to move over so I could also go back to bed, I got more of the same. If there were no pesky work waiting for me, I might be able to nap today. You can bet she gets to nap, even if I have to resort to duct tape. Oh well, this, too, shall pass.